It should be no surprise to the regular readers of Tribulation Now, and particularly those who have been regular listeners of the radio show, that we believe the prophetic warnings in the Bible, for the most part, are LITERAL. This quotation below from Rev. J.W. Brooks in 1840 sums it up. I have written a good number of articles about all aspects of the cosmos as they apply to the Word of God, the Holy Bible. The Bible speaks of “Holy Watchers” as well as “Sons of God” that have left their “first estate”, rebelled against God and ultimately became “fallen angels” or watchers. The Bible refers to “clouds of Heaven” frequently and also to the term “evil angels”. It discusses amazing symbiotic transport craft such as Ezekiel’s Wheel, which was evidently crafted out of living creatures (angelic beings) and various fire and light energy. Its important to note that it “sparkled” and had “brightness all around it” and “radiating out of the midst” of it. And then you have, as previously mentioned the Holy Watchers; Dan 4:13, 23 (as opposed to the “fallen watchers” ref. Book of Enoch, Jude 6). Well who were they? Obviously they were watchers, an angelic class of beings who had the role of watching things on earth. Why do fallen angels need space ships / UFOs? Do they only get space ships AFTER they fall? Why did our Heavenly Father, YHWH, ride in Ezekiel’s Wheel? What was the point of that vision? Do “holy watchers” have intergalactic space craft, or do they simply float about in the cosmic ether, or in some “Heavenly” realm? Why would a fallen angel need a space craft to move between dimensions? If they can bend “space time” could they travel to other planets, possibly other star systems faster than light speed leveraging worm-hole capabilities? Are the “Wars in the Heavens” referred to in Revelation 12 still going on? Who are the good guys? Why are there planet sized space craft shooting laser beams at one another in our solar system? Could there be good and bad angelic beings fighting each other? Could some of Revelation 12 be literal? Is this war over? How long has this war been going on? 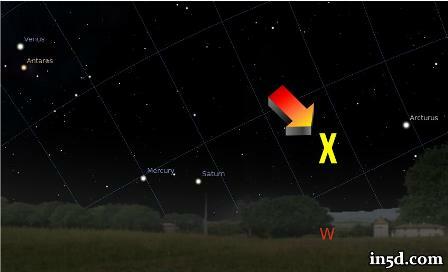 What is in the Western Sky? About 3-4 weeks ago my niece Dawn, from southern central Pennsylvania, started to mention a light in the western sky. I really didn’t think much of it. She continued to mention it periodically over the next couple weeks. She (her and her husband Len) said it looked like some kind of star or planet, but it wasn’t Venus, and they wondered what it was. I asked sister Cathy about it and she started to probe the Internet. We were most amazed at what we discovered. Before I continue it’s important you understand that the Lord has been using the number sequence of 11:11 and 1:11 etc. to signal “His” people. Naturally the forces of darkness, through vehicles like the New Age, have hijacked this phenomenon and insist that it signals “ascension” for their followers. 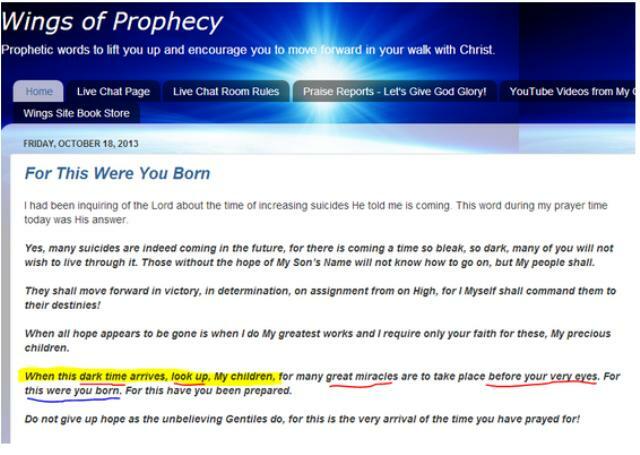 Unfortunately NO ONE is going to “ascend” anywhere except the Bride of Jesus Christ in the rescue mission (e.g. rapture). Indeed it is true that the devil has “no original ideas” and has hijacked everything from God; and this too is one of those things. 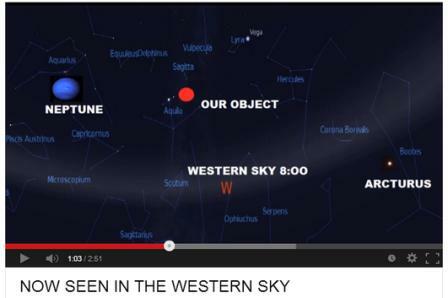 Sister Cathy starts sending me information about the object in the western sky. First she notes that people are discussing it at God Like Productions (“GLP”). There is much discussion. While there are always naysayers, and even paid counter-intelligence plants, the majority of comments indicate they realize this is no common celestial object. Several who are tracking it indicate the object is moving toward earth. The general consensus is this object is not a comet, not a planet, not a star and not a satellite. I will now share with you the two key You Tube videos that were sent to me by sister Cathy from our radio show chat room. What is important to note is that this video was 1:11 in length. But I’m sure this is only a coincidence … right? Here is the link to that video. By now you can see that I was wide awake to the Lord signaling me on the significance of this object. 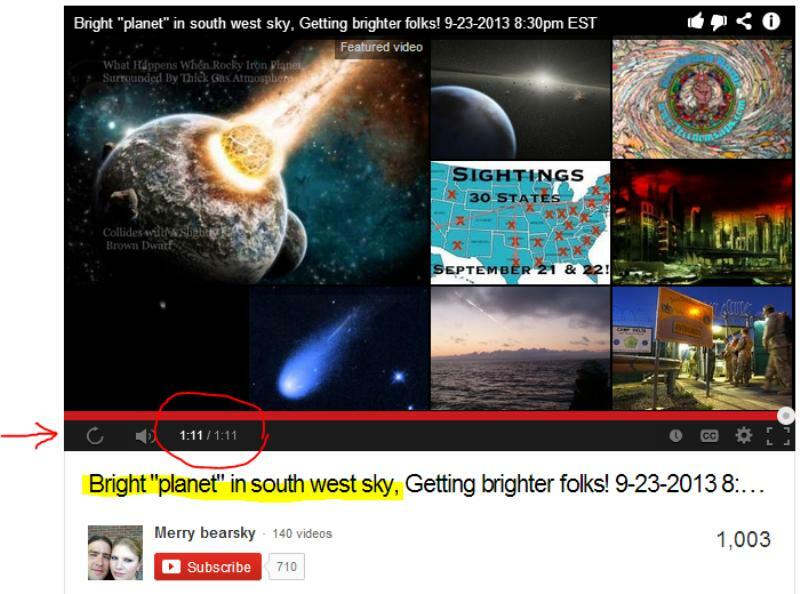 The odds of two separate videos of this object being precisely 1:11 in length must be one in several million. To make this even more impossible, these videos came from completely different people at different times. NOW the Lord has my attention. It became immediately evident to me that this object is a space ship. While I realize this object may disappear from the western sky, I believe its critical to point out its existence and make note of what part it may play in the days to come. As one who has studied the alien / UFO phenomenon with extreme intensity for many years, praise God I am quick to recognize certain telltale characteristics. 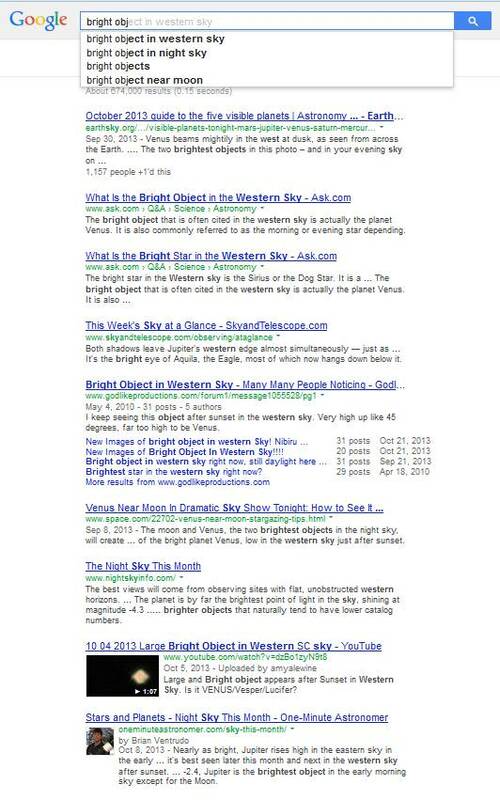 It is not uncommon for these space craft to give off a flickering light appearance from the sky. I find that phenomenon most fascinating when I read the holy Word of God and consider the term “chariots of fire” since this could be related in some amazing way. We see in the Bible that we must be careful of our behavior because there are those who have unwittingly entertained angels. However this manifestation does not seem at all similar to that which Daniel encountered. And the people who were with Daniel did not see the angel but nonetheless ran and hid themselves evidently sensing the presence of God’s heavenly messenger. This manifestation is clearly not the kind a person would unwittingly entertain at their dinner table. So it’s clear that God’s angels manifest in different ways. Sometimes as what appears to be a type of “spirit being” with no tangible “host body”, and other times in a human form able to eat and interact with us in a way that we are unable to detect. In the later form these angels have acquired “host bodies”. This is why our Heavenly Father often refers to himself as the “Lord of hosts”. When an angel of the Lord must interact in this time-space continuum or dimension, they must take on “host bodies”. However, when they are in this state, they also would need protected from the elements of outer space. This doesn’t make them any less powerful and supernatural but evidently does offer them some restrictions. So they pressed hard against the man Lot, and came near to break down the door. 10 But the men (angels) reached out their hands and pulled Lot into the house with them, and shut the door. 11 And they (angels) struck the men who were at the doorway of the house with blindness, both small and great, so that they became weary trying to find the door. These angels did not grab Lot and his family and materialize through the wall in the back of the house to escape. They “struck blindness” into the attackers in order to confound them; making their escape. They then, with the power bestowed upon them from on High, destroyed the city on behalf of the Lord. This explains the concept of “host bodies” when inhabited by angels of the Lord. They evidently have certain physical restrictions as they are inhabiting host bodies. See the movie “Star Man” with Jeff Bridges to get a better idea of these concepts. Once again I would recommend reading the book by John W. Milor entitled “Aliens and the Antichrist“. While there is no possible way to prove all these postulations, they make wonderful sense and are supported by vast scriptural references while maintaining reverence for the omnipotence and majesty of our Father God in Heaven and our King Jesus His only begotten Son. 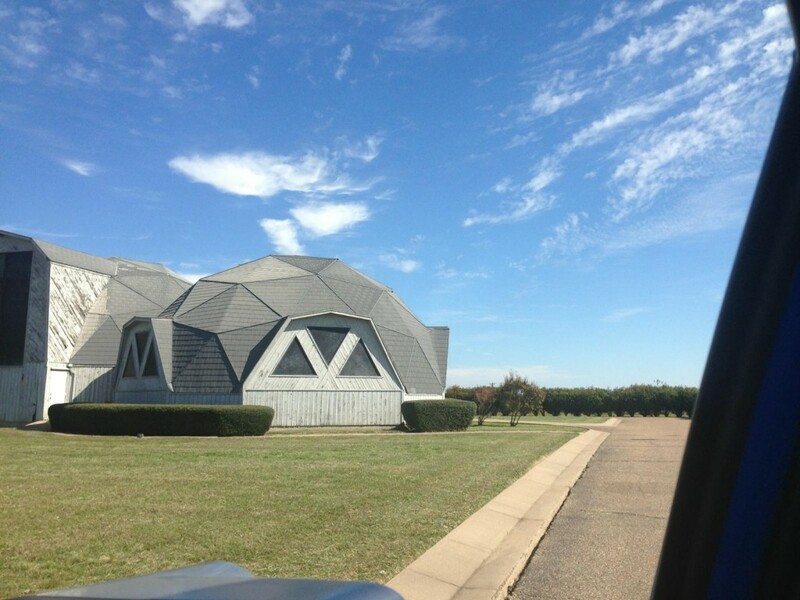 The shape of this space craft like object appears to be a 3 dimensional hexagon. This becomes exceedingly clear when viewed in this video here. Unknown Glowing Light in Evening Sky, Starship? Here is another more recent video with people discussing how this cannot possibly be a normal cosmic object. As shown in the main article image above, this object clearly appears to be a hexagon. Now while there is NO WAY to be sure about any of these things, for those of us anxiously awaiting the redemption of our bodies and the rescue mission of our Lord Jesus Christ, it is exciting to consider who is coming this way. Is this part of the forthcoming “strong delusion” (2 Thess. 2:11b). Could these be forces of darkness? Could these be evil angels being sent from the Lord to destroy the unrighteous during the three days of darkness? Or might these be some of God’s “holy watchers”. We will have to wait and see. If there are hundreds, maybe thousands of alien (fallen angelic) space craft in our solar system already, WHY would the evil angels need to come to earth in a 3-D hexagon shaped brilliant flickering colorful grand light ship? The only answer I can come up with is that they intend to put on a SPECTACULAR show. Otherwise the “evil angels” are certainly traveling in style. Also isn’t it utterly fascinating that the Jewish mystic rabbis deep dive study of Ezekiel’s Wheel indicates that this particular “chariot” is likely a 3 Dimensional Hexagon shaped vehicle? Warning: Be Forewarned this study on Ezekiel’s Wheel is anchored in mystic ancient Jewish studies and is deep into the Kabbalah. In fact “Bible Code” which is also presented by many good theologians today is ALSO anchored in the Kabbalah. The problem is that we do NOT know at WHAT POINT these studies cross the line and enter into the world of the demonic. BE CAREFUL AND DISCERN. Measure everything against the inerrant word of God and the current Bible canon. 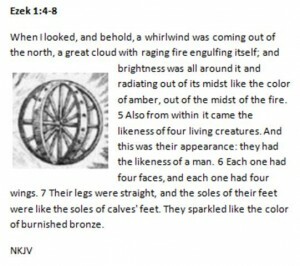 And the Bible speaks about how Ezekiel’s Wheel sparkles and has brilliant light associated with it’s appearance as well. Then I looked, and behold, a whirlwind was coming out of the north, a great cloud with raging fire engulfing itself; and brightness was all around it and radiating out of its midst like the color of amber, out of the midst of the fire. 5 Also from within it came the likeness of four living creatures. And this was their appearance: they had the likeness of a man. 6 Each one had four faces, and each one had four wings. 7 Their legs were straight, and the soles of their feet were like the soles of calves’ feet. They sparkled like the color of burnished bronze. And He was seen upon the wings of the wind. Update Note: Okay – Today is October 24th, and I am talking to Jonathan Kleck on the telephone telling him about this object and how it looks suspiciously like Ezekiel’s Wheel. Jonathan is driving on the freeway as I am describing the shape of the object and this is what he sees on the side of the road. He pulls his car off the freeway to take this picture and send it to me. HOWEVER Lucifer’s power, signs and lying wonders cannot be underestimated either. So we must WATCH and PRAY to see how this all unfolds. This space craft / object COULD be part of the “strong delusion” of 2 Thess. 2:11. This object could be carrying the “evil angels” sent to destroy the unrighteous during the forthcoming Three Days of Darkness. So as always PRAY and DISCERN. You have approximately 60 days to prepare for the influence of an object that is inbound from the Orion constellation. 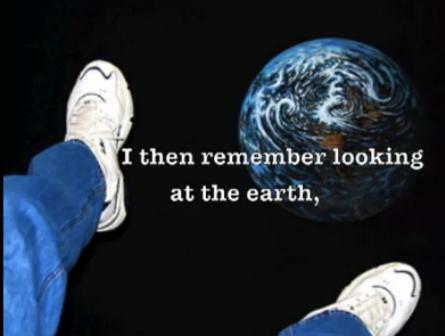 The object will NOT impact Earth, the moon, or any other planetary body in our universe. But, given the nature of the object — life as you know it will forever change. Who knows for sure if this is believable information or complete disinformation from a plant at this point. But nevertheless, it is most interesting. 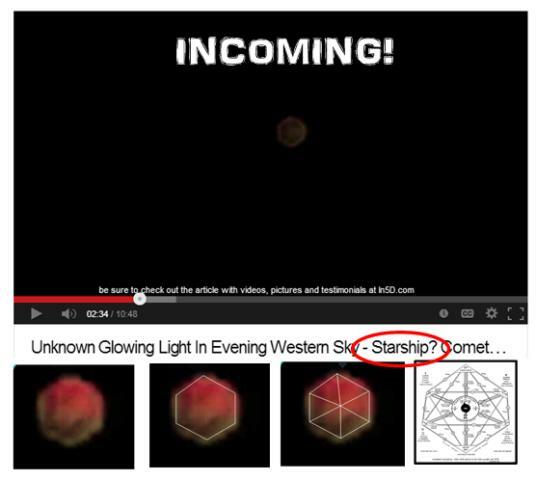 And evidently this object is coming from the Eagle Constellation? That’s incredibly fascinating. Here’s why. I believe THAT’S THE BRIDE! Here is THAT video. It also proves that this object is not a satellite using a program called “Skeye” for data phones. 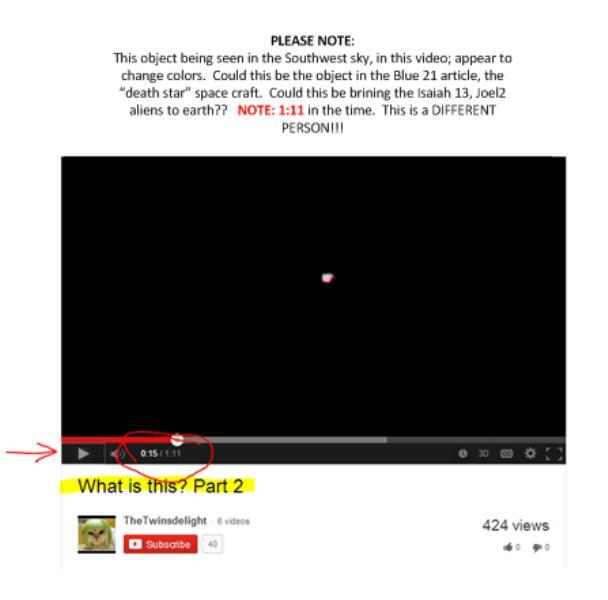 Note: As you can see, in less than 24 hours, this You Tube channel which claimed it was tracking this object for over a year has now removed the video. I find this highly suspicious. We will be following this event closely as it unfold on the Tribulation Now Radio Show and electronic Ecclesia (church) every Wednesday and Sunday Night 8PM Eastern. You can sign up for the radio show by clicking the red “Subscribe Now” button above. Also this article may be updated with new information regarding this object so please keep checking back. God bless you. Joel 2 / Isaiah 13 Alien Invasion in a Dream? 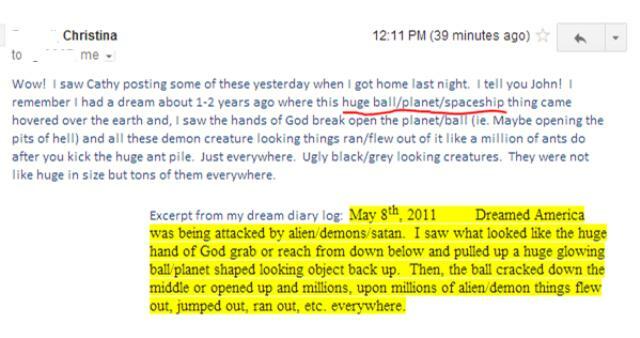 Could this dream given to Christina capture the unfolding of the Joel 2 / Isaiah 13 alien invasion of “evil angels” upon mankind? Tribulation Now has been following a number of key prophets worldwide over the last few years. If you know your Bible, you understand that not all prophets perform the same functions and communicate the same information. While some of the prophecies of the Old Testament prophets overlap, many of the prophets never made it into the current Holy Bible and not all of them spoke of the same events. 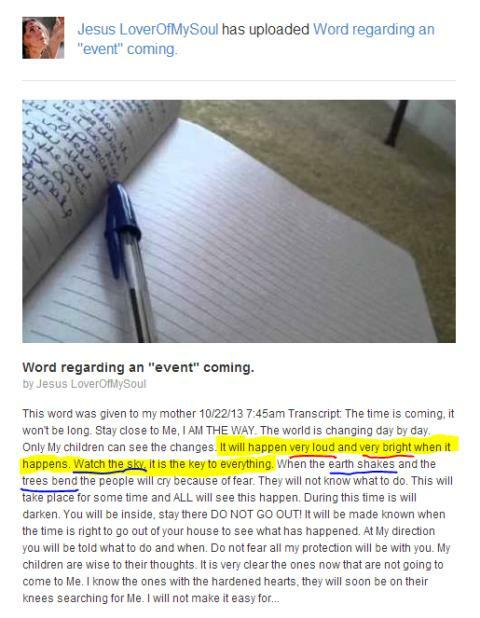 That being said, PRAISE JESUS, Bonnie from Australia has a wonderful gift from the Lord and the Father is using her to communicate the forthcoming “cosmic events” as they grow near. 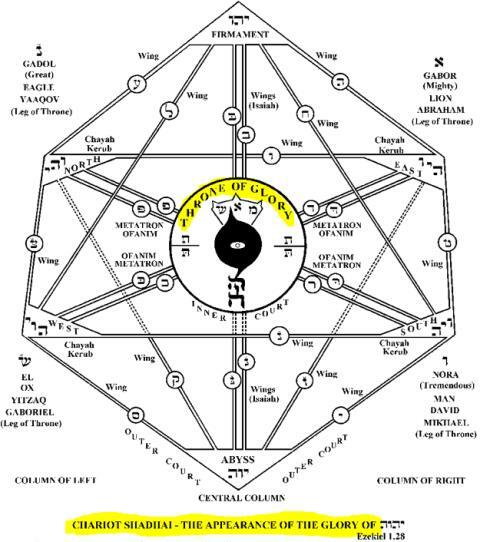 These cosmic events are related to the unraveling of the Sixth Seal. The Bride of Jesus Christ will be on the earth through the Sixth Seal and then she will be removed and taken to Heaven prior to the “wrath” of God unfolding upon the earth. So we know beyond a shadow of a doubt that the BRIDE is GONE from this earth AFTER the unfolding of the Sixth Seal. PRAISE JESUS. Now that being said, here are some powerful prophecies from our Father in Heaven through sister Bonnie of Bon’s Blog – Hearing from God. Bonnie is a retired paralegal specialist in Australia. God BLESS her. Pray for the divine protection of the Lord upon her and her family. Lately the Lord has been revealing the details of the pending cosmic and cataclysmic events through her. 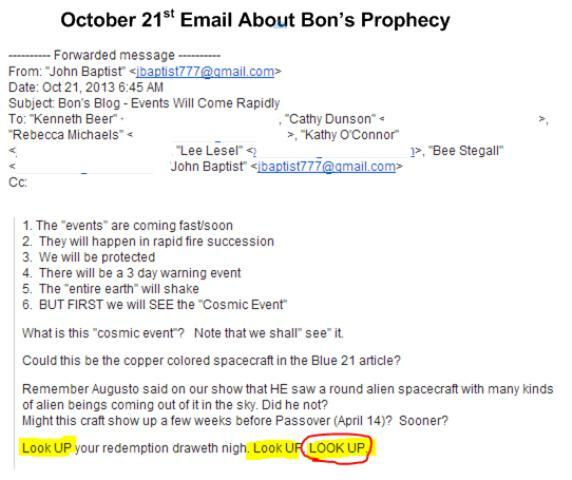 And here is an email I sent to our team about the key events mentioned in this prophecy. Pay close attention to the LORD confirming this through the next series of “coincidences”. Here is the NEXT email I opened that morning from a blessed saint in California named Patricia. And if that’s not enough warning to LOOK UP for you, just a few days ago, Wings of Prophecy just released this Word from the Lord. So as you can see, the Father is working through His body of believers to keep us on the cutting edge of our seats as these forthcoming “COSMIC” events and calamities unfold. ALSO see this update with even more details of what is coming. PRAISE JESUS when you open your heart to the gift of God’s people, and the Words of God coming from the Throne Room, He is giving us SO MUCH. Read 1 Corinthians 12 and make sure your world view of the Lord does not leave a schism in your “body”. For more from this saint see the link HERE. And praise God for my new “in person” local friend Pam. Last night she told me about a prophecy from the Book of Enoch that seems to correlate to this forthcoming event. 1 Be hopeful, ye righteous; for suddenly shall the sinners perish before you, And ye shall have lordship over them according to your desires. 2 [And in the day of the tribulation of the sinners, Your children shall mount and rise as eagles, And higher than the vultures will be your nest, And ye shall ascend and enter the crevices of the earth, And the clefts of the rock for ever as coneys before the unrighteous, And the sirens shall sigh because of you and weep.] 3 Wherefore fear not, ye that have suffered; For healing shall be your portion, And a bright light shall enlighten you, And the voice of rest ye shall hear from heaven. Counter-intelligence professionals and “naysayers” aside, this object is a FACT at this time and it is powerfully exciting given the “Cosmic Warnings” coming from the Throne Room of our Heavenly Father. PRAISE GOD! This is exciting. Powerfully exciting. We are reaching a time such as has never been seen since the foundations of the earth. I pray that you are seeking righteousness and holiness like never before. For the Lord is coming for a holy Bride without spot or wrinkle or any such thing. (…) that He (Jesus) might present her (the Bride) to Himself a glorious church (Rev 3:10), not having spot or wrinkle or any such thing, but that she should be holy and without blemish. You need to PRACTICE RIGHTEOUSNESS right now (1 John 3:7). Cleanse yourself of all unrighteousness by confessing your sins before God (1 John 1:9) and he is fair and just to forgive you of your sins. Read this article here entitled “Being Holy” on how to become Holy to God and practice righteousness. Its NOT too late. PRAISE GOD. My wife and I really love your blogtalk shows on Sunday and Wednesday nights and we look forward to every new show. May God richly bless both of you and protect you in these last days as you prepare and warn His people for what is coming to this planet. I look forward to meeting both of you in Heaven when we leave this demon infested rock! God bless you deeply brother. Amen let’s get out of here as soon as possible PRAISE YOU JESUS! I was in a auditorium full of African people, they were seated all around me and long tables, and my table was in the middle of them. A group of them at a table to the right of me started praising Allah, saying Allah Akbar! I felt something welling up inside of me and I could not take any longer. I stood to my feet and I opened my mouth and in the loudest voice I yelled JESUS, it was almost like a song not just a word. Can’t explain it. And I just kept saying it, and those guys shut up and started looking and listening to me, and I knew I was pregnant and the baby should have been born May 21st, but had not come yet…it was 2 weeks past my time to give birth! I went to the Hospital but no Dr. could see me, they told me I did not have an appointment, No one would help me and I woke up. Johnny, what will the homeless people do, like me? We are to go into our place for the 3 days of darkness. I am evicted again. For now I am staying in a gay womans home who practices science of mind. I am afraid to be there. I am afraid to be out in the wilderness in upper rural california. I am afraid to be on the streets of the town. What do folks like us do? You do exactly like the rest of us and you seek Jesus on your knees with all your heart in full surrender and repentance. We are all in this together. If you are righteous before God HE WILL PROTECT YOU. His angels will be here for HIS PEOPLE. Dear Brother John, Do you believe this is Nibiru? There has been so much talk about it and this seems to fit the criteria for the return of the annunaki. What do you think? I appreciate your input. Thanks! No its not Nibiru. To me it appears very much like it may be the manifestation of Ezekiel chapter one coming to earth. Why does Ezekiel 1 exist in the Bible? Why did God give Ezekiel that vision in the first place? For a time such as this perhaps? On the other hand be prepared for ANYTHING and watch and pray. Look UP your redemption draws night? 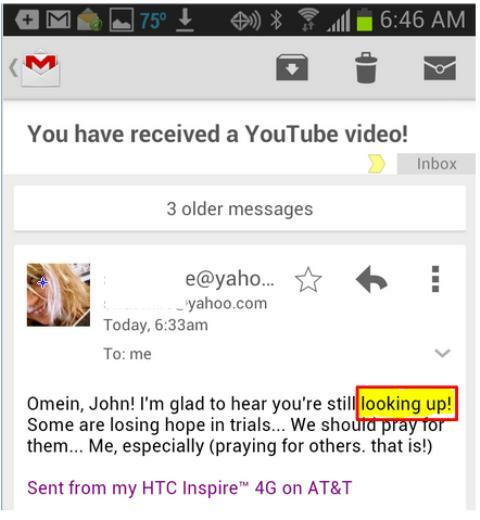 Why does the Lord tell us to “LOOK UP”? What is it we are looking at? Who knows for sure. God bless you. Great site! Love reading everything. How wonderful (!) to realize our Beloved Jesus will return soon – Oh Lord, do hear our sorrowful cries in this wilderness, have mercy on us, return to us replacing the evil with your love and righteousness over all the earth! Amen and amen ~ love and prayers to all. What an exciting time to be living. Theres a prophit from porta rico that sounds like the samething, he says a astroid is going to hit on west side of porta rico and that there will be a 12. hearthquake also a sunamei and i think in his video he said something about the earth would stop spinning and there would be three days of darkness.And also this was to be a jughment on the chirch becuase of its sin. That’s correct. Amen. Ephraim Rodriguez is the name of that prophet. Yes there will be a huge comet that smashes into the ocean near PUerto Rico and causes a destructive tsunami that kills approximately 26 million people along the east coast of the US. God bless you.